The song of the northern leopard frog (Lithobates pipiens or Rana pipiens) is a sure sign of spring in North America. 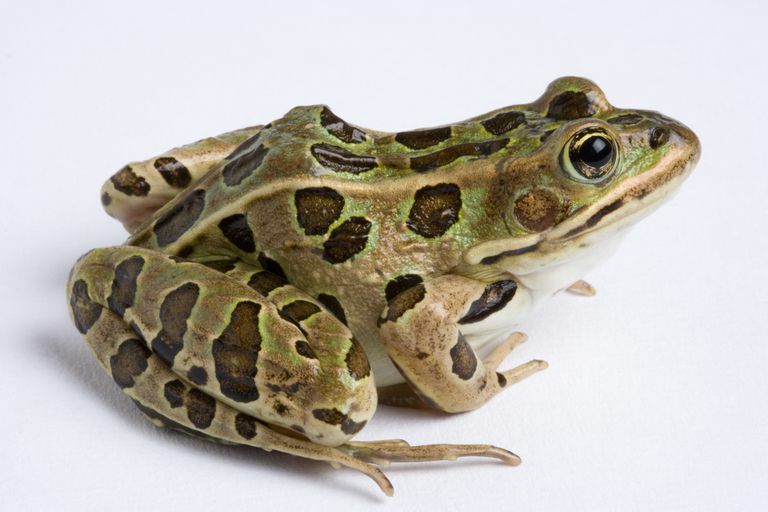 While the northern leopard frog is one of the most abundant and widespread frogs within its region, its population has declined so significantly that it's no longer found within parts of its range. The northern leopard frog gets its name from the greenish-brown irregular spots on its back and legs. Most of the frogs are green or brown with spots and pearly while undersides. However, there are other color morphs. Frogs with the burnsi color morph lack spots or only have them on their legs. Albino northern leopard frogs also occur. The northern leopard frog is a medium to large frog. Adults range from 3 to 5 inches in length and weigh between one half and 2.8 ounces. Mature females are larger than males. Northern leopard frogs live near marshes, lakes, streams, and ponds from southern Canada through the northern United States and south into New Mexico and Arizona in the West and Kentucky in the East. In the summer, the frogs often venture further from the water and may be found in meadows, fields, and pastures. The southern leopard frog (Lithobates sphenocephala) occupies the southeastern United States and is similar in appearance to the northern leopard frog except that its head is more pointed and its spots tend to be smaller. Tadpoles eat algae and rotting vegetable matter, but adult frogs are opportunistic predators that eat anything that will fit within their mouths. The northern leopard frog sits and waits for prey to come near. Once the target is within range, the frog leaps and snatches it up with its long, sticky tongue. Common prey includes small mollusks (snails and slugs), worms, insects (e.g., ants, beetles, crickets, leafhoppers), and other vertebrates (small birds, snakes, and smaller frogs). The frogs do not produce offensive or toxic skin secretions, so they are preyed upon by numerous species. These include raccoons, snakes, birds, foxes, humans, and other frogs. Northern leopard frogs breed in the spring from March to June. Males make a snore-like, rumbling call to attract females. Once the female selects a male, the pair mates once. After mating, the female lays up to 6500 eggs in the water. The eggs are gelatinous and round with darker centers. The eggs hatch into tadpoles that are pale brown with black spots. The rate of hatching and development depends on temperature and other conditions, but development from egg to adult typically takes between 70 and 110 days. In this time, the tadpoles gain size, develop lungs, grow legs, and eventually lose their tails. The IUCN classifies the northern leopard frog's conservation status as "least concern." Researchers estimate hundreds of thousand or millions of the frogs live in North America. However, the population has been rapidly declining since the early 1970s, especially in the Rocky Mountains. Laboratory research suggests a possible explanation for regional decline relates to the effect of higher-than-normal temperatures on crowding and bacterial infection. 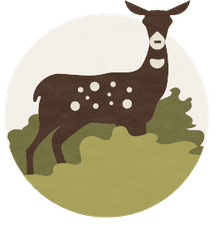 Other threats include habitat loss, competition and predation by introduced species (especially bullfrogs), hormonal effects of agricultural chemicals (e.g., atrazine), hunting, trapping for research and the pet trade, pollution, severe weather, and climate change. Northern leopard frogs are widely kept in captivity for science education, medical research, and as pets. Educators use the frog for dissection, to teach about how muscles are used for different modes of locomotion (swimming and jumping), and to study biomechanics. The sartorius muscle of the frog remains alive in vitro for several hours, allowing experimentation on muscle and neuron physiology. The frog produces a type of enzyme called ribonucleases that are used to treat cancer, including brain tumors, lung tumors, and pleural mesothelioma. Northern leopard frogs are popular pets because they prefer temperatures that are comfortable to humans and eat readily available prey. Conant, R. and Collins, J.T. (1991). A Field Guide to Reptiles and Amphibians: Eastern and Central North America (3rd Ed.). Houghton Mifflin Company, Boston, Massachusetts.